I always highlight that reading more won’t make you stupid… However, if you principally read stories that are not true then the likely hood is that you may believe that life works in the way as described in what you are reading. The same could be said of television- as I highlight to my wife. In season- I love a bit of Game of Thrones, sometimes I could consider maybe it’s a bit “real” (no I haven’t gone full blown crazy), I mean at one point in time you had to pretty much run around with a sword! Am I right- of course I am. Now when the magic and dragons turn up I pretty much understand that they might not be real- well I haven’t seen many dragons recently. This is fantasy comparing this to the hospital drama Gray’s Anatomy where it seems you take your life and close relationships in to your hands once you take on your employment contract- I mean if you or your significant other isn’t crushed, beaten or shot within two years working in this hospital it’s a miracle. They both aren’t real if you needed clarification… though they are entertaining. You will only lose fat weight if you are in a calorific deficit. It’s not a fantastical story about your hormones. Overall your weight can be manipulated by what you eat and drink. Body composition is only changed if you engage in a calorific deficit or surplus. Low carb diets work best for fat loss. Fasted exercise is better than non-fasted exercise. None of them are true. If you eat fat and you are in a calorific deficit then you will lose weight. Low carb diets are as effective as low fat diets in the research. Fasted cardio is not better if you control for exercise intensity and volume. Where does that leave us? It doesn’t leave us in a place with a fantastic story- in fact it leaves two options. Control calorie intake and adapt exercise/ activity as necessary in line with your current weight/ lean muscle content. Each of those statements have been uttered in the main stream media, on television and in print recently. What’s the result? People believe these things are real. Now they may not start pouring cream on all their meals and eating cheese like there is no tomorrow but it does confuse the message of a balanced diet and healthy sustainable weight loss. If you know the difference between dragons being real or pretend, then that’s fine, just as the perils of taking a hospital job in Seattle. If these programmes are being delivered as factual accounts and people believe they are real then the world would be going crazy. Some things can be dramatized- health advice probably shouldn’t be. With a lot of the guys we work with they have some pretty full on demands for maintenance of shoulder stability and mobility. Twinned with our fitness clients and the wear and tear of everyday life certain exercises are pretty much a necessity for building healthy robust shoulders. Primarily, in the sporting arena we work with a lot of swimmers and tennis players. The overhead carry is great as it encourages upward rotation of the shoulder blade. If we lose upward rotation during a movement we may typically resort to placing more emphasis on to the elbow and shoulder joint rather than allowing the muscles around the shoulder blade to do the job to the best of their abilities. Swimming and tennis also have a lot of force placed upon the shoulder when it is overhead or near to full extension. This means that injury risk is highest if you can not stabilise the joint in place. Single handed this exercise places a challenge to the rotational stability function of the abs as well as maintaining anterior core control – in simple terms it allows your abs to do the work as opposed to your lower back arching through the movement. Loading this exercise can make the form pretty poor quickly if your ego is bigger than doing things properly. So try it out- we give it to some of our trainees early on in sessions to encourage good core position. We also use it as a challenging finisher- that said if you have had a heavy upper body training day form can fall apart on pretty low loads. With the increase in our membership at Results FAST it’s getting quite hard to write quality articles in the volume I used to (excuses are excuses- and quality I guess depends on opinion, I will generally cede that my grammar and sentence structure are marginally better than a 16 year olds). This one came to me quite quickly today due to the fact in that in a number of our clients programmes this month we have included the old school classic “bent over rows”. Now without invoking thoughts of the 80’s, Arnie and Carl Weathers (if you do not know, please watch Pumping Iron and Predator) this exercise in most gyms is absolutely bastardized. It’s meant to be for the mid-back and core but often becomes an upper back/ neck exercise… ideally we are looking to work the mid-trap/ back area. Cue Admiral Ackbar’s physiology course. WARNING…….. OWN TRUMPET BLOWING COMING UP…. As a principle exercise all of our clients are taught to deadlift/ pick weights up safely. In turn when you know what your lower back is meant to be doing (due to totally excellent coaching… ahem) it becomes hard to cheat the movement. 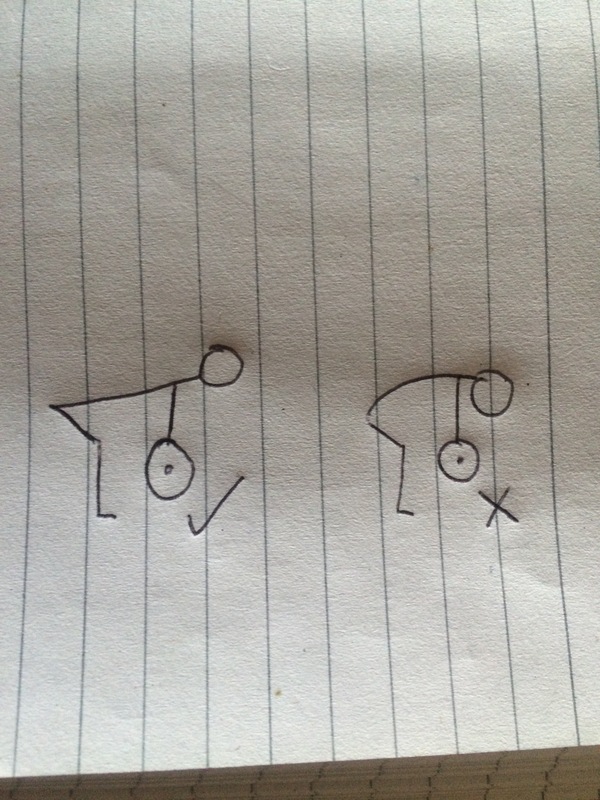 With this exercise it looks sub-par when you can’t maintain core control e.g. you fail through your lower back strength as opposed to the load you are lifting- poor form has nothing to do with weakness in the “target” muscle groups of the back and arms. In a lot of cases people will smash their set out with a rounded back position compromising correct technique for a weighted ego boost. Where else is this relevant? Well… deadlifting e.g. picking anything up of the floor safely, kettlebell swings (torso flexion is a no-no) and squatting (both front and back). It’s basically relevant in 3 major bilateral lower body exercises- this highlights how your upper body programme can be improved by learning key lifts such as the squat and deadlift. Most of the time I try to finish articles with a take away piece of info or something you can put in to action on your next gym visit. This time though it’s simply master the basic position of hinging at the hip and then load appropriately. If you struggle to achieve this position look at two things your “core” strength (your ability to maintain position) as well as your hip mobility. If you have a lower body that’s tighter than my wallet (pretty tight) then try to do big exercises may be a step too far and working on your hip mobility may allow you to develop better athletic ability- I would consider this a better spend of gym time as opposed to trying to perform an exercise in a sub par fashion under load. More news and views from Results FAST: Foam Rolling, Social Media and Fitness Industry Professionalism. Pre- workout: evidence currently suggests that there is an improvement in joint flexibility as well as no negative effect to performance (in comparison to just stretching which can see decrements). Short-term (in session) recovery: evidence suggests foam rolling reduces the deterioration in jump based movements performance. Long term recovery: Foam rolling seems to reduce muscle soreness and the ability to train more frequently. Health: Foam rolling may reduce arterial stiffness and may be of benefit to arterial health. Also here is a link to some of the soft tissue drills we work with. 2. Motivation and mindset “training.” Simply, if pictures on social media motivate you then we can’t help you (that is unless the picture is you). Photo shopped images with quotes written over the top are not motivating- if anything (on consulting our members) they are building up an image that is only relevant to the top 2% of exercisers). We were told by our website guy that we should post up to three times a day on social media- many businesses do this by sharing this type of content, we don’t as we believe what we share on-line is representative of our business. That’s why we only share credible articles by companies and individuals in-line with the same focus and ethics as Results FAST. 3. Leading on from the above…. Professionalism and the fitness industry. If you are going to try and sell us something at the gym be it a product, piece of equipment, workshop or course then please, please, please just say “We want you to buy our product.” This week I have had three conversations with people who were promising me a unique opportunity (in one case the product will probably stay pretty unique but that’s another story). One company posted straight to our Facebook business page- you could have called or e-mailed but no they basically spammed us. In the past couple of months we have been visited by trainers/ managers from other gyms- we know because our members used to train at your centres and they recognize you. If you want to come in and see how we work just ask- don’t go through a convoluted game of cat and mouse pretending you are interested in training with us, we would respect you more if you admitted “We want to see how well you do things” (because you wouldn’t bother coming in if you didn’t think we where that good:). Professionals share anyway- steal/ replicate if you can but you can’t replicate experience and a good education. On the positive side of things big shout out to a supplement rep though- they contacted us and asked if we would like to sample their product and then sent us basically enough protein, sports drinks, smoothies to sink a battle ship (I love free stuff). We might not buy their product but I will still respect their companies professionalism and the fact that there was no hard sell straight out from them. Just as fat was demonized in the 1980’s sugar seems to be taking a bashing as dietary zealots whipping boy. With sugar avoidance becoming the latest media headline it’s compelling that sugar now plays the role that saturated fat once played and it is now responsible for the obesity epidemic that was once fats responsibility. With what has been published you never really hear about the positive side of sugar or how it is used in the human body. Overwhelmingly the opinion of newspapers and numerous documentaries is that sugar is evil incarnate and will get you addicted, hooked on the giddy feeling of euphoria that only milk chocolate can give before you are sat in a pile of high sugar energy drinks looking for your next hit if you can get your obese frame out of bed. The alarmism highlights that sugar correlates with a number of diseases from diabetes, hypertension and heart disease. However all of these conditions are multi-factorial in cause. You cannot attribute their development purely to sugar intake. Lifestyle and other dietary behaviours are also responsible. What also is clear is that over the last 30 years activity has decreased as we undertake more sedentary occupations while total calorific intake has increased by over 400 calories daily. Sugar consumption although being blamed for the increase in people’s weight has only risen by a few calories on average since the 1970’s. In fact the consumption of fats, oils, dairy fats and flour and cereal products have increased by about 180 calories which is about 4.5 times the average increase in the intake of sugar. In summation- we are not eating excessively more sugar than what we were consuming 30 years ago. This point highlights that modern lifestyles indicate we are eating more of everything and we are less active than the previous generation. It’s a bit hard then to primarily blame sugar for this issue as we do not see an exact change in sugar consumption. In the next post I will highlight the role that sugar plays and how science has been twisted in pursuit of a media story.